Found one file extension association related to RackTools and 1 file format developed specifically for use with RackTools. Developer: Middle Atlantic Products, Inc. Developer / company: Middle Atlantic Products, Inc.
Middle Atlantic Products is pleased to announce the release of RackTools 3.5! We’ve updated RackTools to make creating a system layout even faster and easier than before. Through improved navigation, smaller file sizes and faster running, this is the easiest way to lay out an enclosure system. 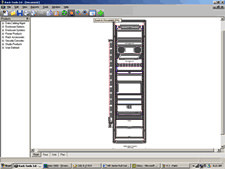 RackTools software increases the efficiency of your business by allowing engineers and salespeople to quickly and easily specify Middle Atlantic Products, and create accurate rack elevation, plan, side and rear view drawings, purchase orders, and quotes in minutes. This innovative software utilizes the familiar drag-and-drop interface for creating scale system drawings incorporating every product available from Middle Atlantic Products. Once you've completed your RackTools(r) CAD layout, you're only a few clicks away from printing a professional proposal drawing for your client, as well as a purchase order form that is ready to be faxed to your distributor for immediate processing. If you need more information please contact the developers of RackTools (Middle Atlantic Products, Inc.), or check out their product website.